Rustic River Cabin is a historic Virginia riverfront cabin built between 1910 and 1930. It features 2 beautiful stone wood burning fireplaces (wood provided)! Incredible sunsets!!! Amazing hot tub!!! 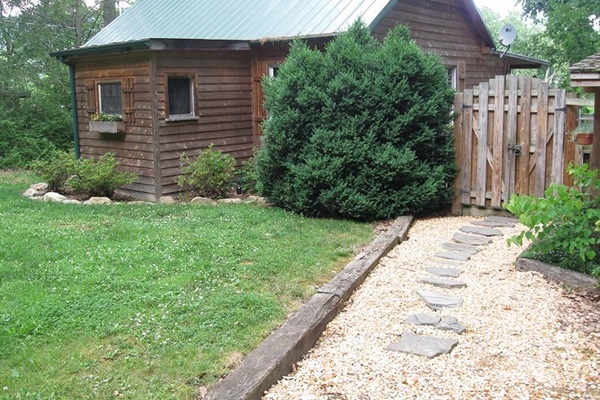 This Virginia cabin is just outside the town of Luray, Virginia and is centrally located to all activities such as Skyline Drive hiking, Luray Caverns, canoeing, horseback riding, and much more. Rustic River cabin is a beautifully decorated cabin with antiques and stained glass, designed for “couples only” and is the perfect honeymoon getaway with fabulous views, views and more views by day including the GW National Forest and star gazing from the hot tub at night. The hot tub in situated on a large 30X40 sq. ft. deck designed with a mature tree growing up through the middle which holds night lanterns and has amazing views of the river. The steps leading down to the river make the river very accessible and the observation deck is awesome. The upstairs deck also features a unique privacy fence and gate that is divine with "the old world charm" hinges and door latches and creates privacy. Enjoy the view of 4 or 5 different sets of small rapids on the river and access to a one hundred year old fishing spot.